There is so much to do in Door County during the summer, especially in July, and Ephraim Shores Resort is the perfect family friendly resort in Door County to use as your vacation headquarters. The month kicks off with Fourth of July activities throughout the peninsula, including fireworks, parades and the Hairpin 5K Run/Walk in Fish Creek on July 4. The first day of fireworks is July 3 in Egg Harbor, followed by fireworks on July 4 in Sturgeon Bay, Washington Island, Baileys Harbor and Gills Rock, and finally on July 7 in Fish Creek. There is no better way to celebrate the Fourth of July than with your family in Door County. One of the best parts of the summer is being on the water! In addition to overlooking Eagle Harbor, Ephraim Shores Resort is less than a mile away from Ephraim Public Beach. After a day at the beach you can come back and watch the sunset over the water on our private sundeck. A short walk away from Ephraim Shores is South Shore Pier where you can rent pontoon boats, WaveRunners and paddle boats or Bay Shore Outfitters Ephraim Kayak Center where you can rent kayaks and paddle boards. For a day full of family fun, go boating, kayaking or stand-up paddle boarding in Door County. The harbor offers beautiful views on the water, as well as easy access to some of the peninsula’s biggest attractions such as Peninsula State Park’s Nicolet Beach, Horseshoe Island, Eagle Bluff and Eagle Lighthouse. Down the street is Wilson’s Restaurant and Ice Cream Parlor which has been a fan favorite in Door County since 1906. When you stay with us you can make any day a little sweeter by walking over to Wilson’s. We’re also walking distance away from the iconic Anderson’s Dock and Marina, which features the Hardy Gallery. Other family outings throughout Door County include going to Red Putter Mini Golf in Ephraim or Skyway Drive-In in Fish Creek. “We are a very family friendly resort in Door County striving to create memories for guests of all ages. With our location being at the heart of Ephraim you will never run out of things to do,” says Jolynn Nelson, co-manager at Ephraim Shores. Located in downtown Ephraim, with a private sundeck overlooking Eagle Harbor, Ephraim Shores Resort is the family friendly resort in Door County for groups of all sizes. From our many room types to our beautiful waterfront location, Ephraim Shores has everything your family needs for the perfect vacation. 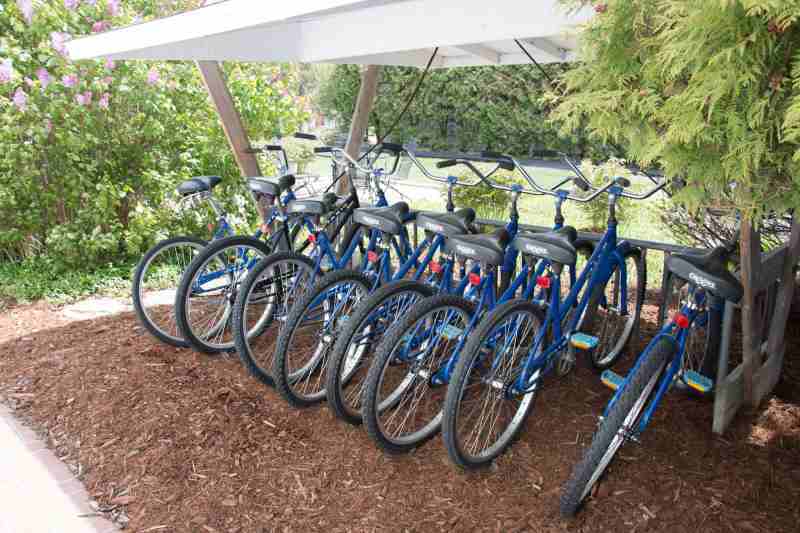 Some of our amenities include an indoor pool and hot tub, and bikes for our guests to use. Contact us at 877-854-2371 or visit our website at ephraimshores.com to make your reservation.